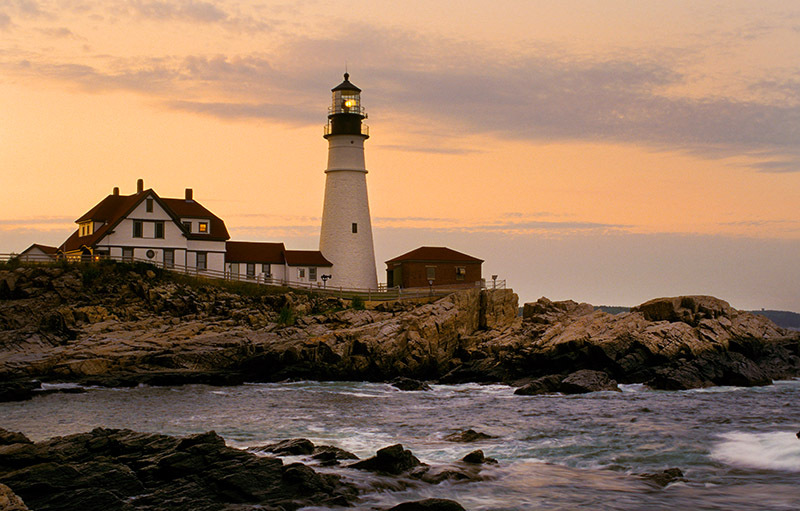 Portland Head lighthouse at sunset. Portland Head Lighthouse is Maine’s oldest lighthouse, built in 1791 during George Washington’s presidency, and one of the oldest lighthouses in America. Its location set atop a rocky cliff on the shoreline marks the picturesque entrance to Maine’s Portland Harbor in Casco Bay. There were four shipwrecks that occurred in the vicinity of the lighthouse, three a very short distance from the lighthouse, and one a few miles south of the lighthouse near Cape Elizabeth Lighthouse. Two of these, the wreck Annie C Maguire and the wreck of the Bohemian are the most well known and are rather intriguing in their stories. After the tragedy of the Bohemian, improvements in the vicinity were made off shore and in the eventual raising of the Portland Head Lighthouse tower. Portland Head Lighthouse is also known as having four generations of the Strout family in dedicating over 100 years of combined service to the beacon. In the 1820’s, Joshua’s Strout’s mother had worked as the teenage housekeeper at Portland Head Lighthouse for an earlier keeper, Captain Joshua Freeman. She was so inspired by the joyful keeper, that when she married years later, she named her son Joshua Freeman Strout. Joshua Strout went to sea at the age of eleven and by the time he was eighteen he became a cook on a tugboat. He later became a captain of the brig Scotland, in 1854, where he sailed and transported cargo around South America. He captained other vessels and enjoyed sailing all around the world dealing in foreign trade. It was more of a majestic adventure for these men drawn to the ocean, than being planted on shore in America in those times. With the excitement of exploration and trade to other countries, came many pleasant and often rough times. Some of the difficult periods included many bad storms, long stretches over open waters where time would seem to stand still, occasional mutinies to deal with when food supplies dwindled or had gone bad, or abusive captains. During the gold rush of California, Strout helped to transport many “Forty-Niners” to San Francisco in search of their fortunes. Portland Head lighthouse on a stormy day. Sometimes deep-water sailors like Strout, were retired to respectful positions on shore as a result of accidents, or, if they were lucky to live long enough, of old age. A severe fall from the mast of his ship, Andres, forced Captain Strout ashore, and in 1869, he was made keeper of the Portland Head Lighthouse, with the help of his mother. His wife Mary served as assistant keeper for ten years with him until 1877, when their fourth son Joseph, at the age of 21, took over the duties as the new assistant keeper to help his father. The Strouts loved the life at the lighthouse and Joshua would frequently meet with the famous poet Henry Wadsworth Longfellow, who lived nearby in Portland. Longfellow would visit the lighthouse a day or two each week and the two men would enjoy many pleasant conversations together, becoming close friends. 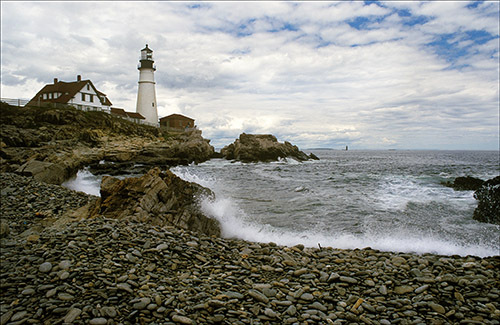 Longfellow’s famous poem, “The Lighthouse”, was believed to have been written while sitting on the rocks by Portland Head Light as he was enjoying the beauty that engulfed the region. Joshua rarely took any time away from the light, as was the case of many dedicated lighthouse keepers. He is known to have gone a period of nearly 17 years without taking any time off. Over the years, Joshua and Mary raised 11 children at the lighthouse, but had lost three of their sons at sea. During a hurricane on September 8, 1869, Joshua barely escaped death when a fog-warning bell was sent crashing over the cliff below the lighthouse. Their most famous rescue involves the wreck of the Annie C Maguire, on Christmas Eve in 1886, around 11:30 p.m. The vessel ran aground on the rocks nearly 100 feet from Portland Head Lighthouse. Apparently the Captain could not see the lighthouse in either the heavy rains or possible snow squall and misjudged his location. The Strouts were preparing to turn in when they heard the crash. They rescued all eighteen people safely while the ship lie wedged on the rocks, and remained as gracious as they could while the starving crew proceeded to eat all their food. Creditors a short time seized the wreck later but little was found of value. Turns out the Captain and his wife, who were released days earlier, got away with stealing any valuables. It was an experience the Strout family would never forget. Joshua Strout passed away a few years later at the age of 81. The Strout family combination of father and son were keepers of Portland Head Lighthouse for a total of 59 years from 1869-1928. When the assistant keeper position traditionally promoted to John Strout, Joseph’s son, on his 21st birthday in 1912, he became the third generation Strout to serve in a government position at Portland Head Light. It was on his birthday that John Strout to decided to paint an inscription to commemorate the location of where years ago the Annie C Maguire had wrecked on the rocks close to the lighthouse. He had to chip a large portion of the rock away in order to create a flat surface on which to paint. After mixing mortar, sand, and some paint together, he painted the words “In Memory of the Ship Annie C. Maguire, Wrecked on this Point Christmas Eve, 1886.” He had a wooden cross, placed on top of the rock as well. The wooden cross has long since washed away along with the original painting, but the inscription has been periodically renewed and repainted over the years. 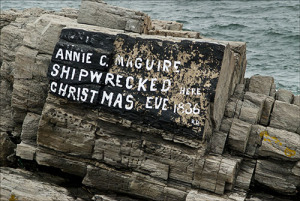 It has evolved into a more simpler inscription reading “Annie C Maguire, Shipwrecked Here, Christmas Eve 1886” which displays today for residents and tourists alike. 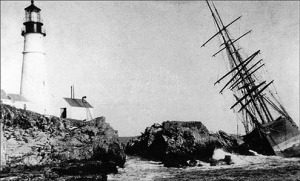 Along with the Annie C Maguire, there were two other vessels that wrecked near Portland Head Lighthouse afterwards, and were almost at the same location as the Annie C Maguire. One occurred during a severe winter storm on November 30, in 1887, less than a year after the wreck of the Annie C Maguire. 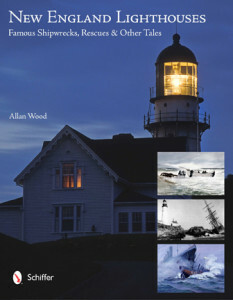 The schooner D. W. Hammond was caught in the blizzard and crashed onto the rocks a short distance from the lighthouse. Joseph Strout and his brother Gilman ran out to the shore where they could see the wreck. They were able to get a line out to the captain and his two crewmembers on the vessel and pull them safely to shore before the vessel broke apart. Many years later, on October 4, 1932, the 72-foot schooner Lochinvar, carrying a cargo of over 20 tons of fish, was caught in a heavy fog near Portland Head Light. It crashed on the rocks by the lighthouse less than 100 feet from where the Annie C Maguire had struck some 46 years before. The cargo was destroyed but the captain and crew survived the ordeal. John Strout served at Portland Head Light for a few years as assistant, then later served at nearby Spring Point Light, and then at the Lighthouse Depot in Chelsea, Massachusetts. The Strout family of four generations served a total of 128 years as lighthouse tenders, with over 100 years of combined service between family members, including Joshua’s mother’s tenure as housekeeper, at Portland Head Lighthouse. There were many family members of different lighthouses that would be involved in tending a lighthouse, including wives of keepers, or their sons, but rarely there would be four generations of family members servicing at the same lighthouse. Other members of the Strout family served at nearby lighthouses in Maine. Len Strout was the keeper a few miles from Portland Head Light, at Portland Breakwater Light, or commonly known as Bug Light from 1866 to 1867. Arthur Strout served as an assistant keeper at Halfway Rock Lighthouse, out in Casco Bay. The current Strout family, from whose ancestors served in the lighthouse, donated items a few years ago. Among the items donated is the original brass lamp that was in used to light the lens in the lantern room of Portland Head Light on Christmas Eve, 1886, the night of the famous wreck of the Annie C Maguire, crashed upon the rocks by the lighthouse. Portland Head lighthouse is located inside Fort Williams Park. The park is huge with plenty of room to hike around the rocky cliffs along the ocean, and even go kite flying. The Portland Museum lies inside the old keeper’s house and has plenty of marine and nautical artifacts, along with all kinds of information on the lighthouse’s history. This is definitely a historical location worth exploring.